The MuseWomen Initiative started in 2013 as an impassioned breakout conference session to talk about women and leadership in the museum technology sector. More meet-ups have followed, and the community has responded positively- this is something people want to talk about! Discussion topics include money, skill acquisition, career advancement, as well as how the museum field could be an example for other technology sectors struggling with implementing diversity across their organizations. The more we spoke about how to better support women in the field, the more we realized that we needed to move from talking to action, and thanks to the ongoing leadership of Brinker Ferguson (@brinkerf) throughout 2015, we have made some important strides in establishing two new projects. Our pilot mentorship program, chaired by Liz Filardi (@lizfilardi) of the Met, is designed to supplement the MCN2015 conference experience (with no formal affiliation to MCN). Mentoring is one of the most important ways to establish a foothold in a community, and we created this program to bring intention and a lightweight structure to something you may already be doing unofficially. Here’s how it will work: Prior to the conference, we will carefully assign mentor/mentee pairs based on the responses. On the first day, we will host a casual meet-up, and on the last day, we close with happy hour. That’s basically it. We’ll provide some tips to make the most of the experience, but you decide the rest: when to meet during the conference and if you want to keep in touch afterword. Anyone attending MCN can participate as a mentor or a mentee. If you aren’t going to the conference, please share your email with us anyway, for (what we hope will be) future online iterations. To join us, please complete the mentorship questionnaire by October 1. Additionally, we are collecting information to better understand some of the opportunities and roadblocks for women in the field. Designed by recent graduate Cait Reizman (@MuseumAdvoCait), this survey will help us to better understand the employment landscape for aspiring, current, and past museum workers, interns, and volunteers. We seek responses from people of all gender identities who live in the United States. Data collected will be anonymized and used to report on women working in museums. We hope to present on the information gathered at future conferences as well as publish a report online in 2016. The survey takes about 5 minutes, and we are looking for about 50 more responses. Please share your information on the survey by October 1. 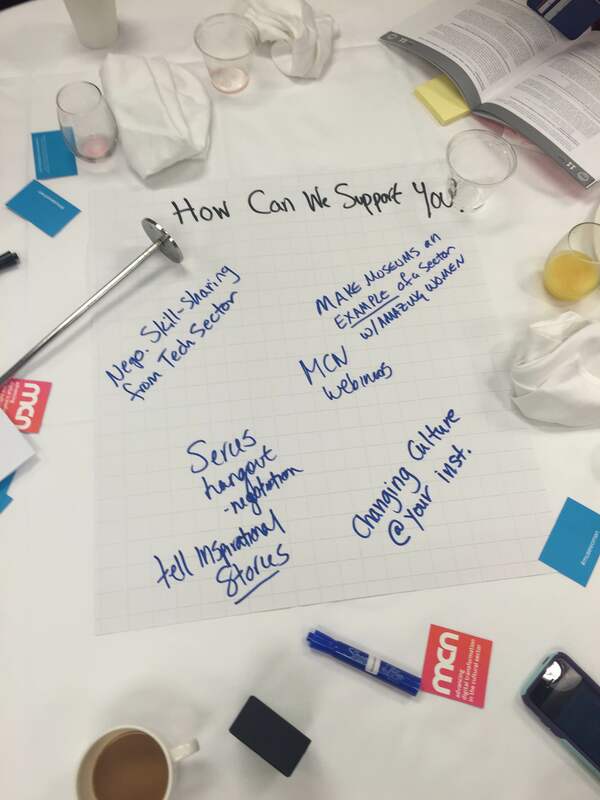 Questions about the #MuseWomen Initiative can be directed to the #MuseWomen team at musetechwomen@gmail.com. We look forward to hearing from you! Header Image: TechCamp Tel Aviv, Photo by Matty Stern, U. S. Embassy Tel Aviv. Flickr.com.